The Marketplace contains applications that were developed by the Red Pitaya community. Please note that the contributed applications are not supplied and tested by the Red Pitaya team. However, we are constantly in contact with the application developers and we strive to make these applications work in the best possible way. What do I need to use the Marketplace? 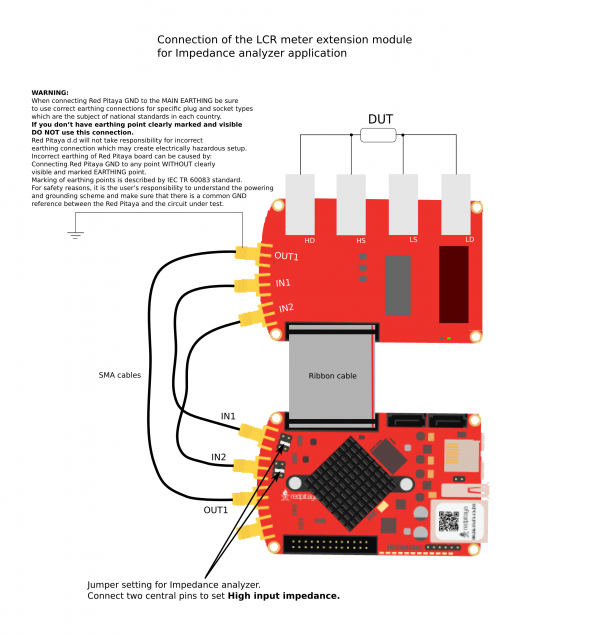 To use the Red Pitaya STEMlab Marketplace only one version of the Red Pitaya STEM board is needed (STEM 125-10 or STEM 125-14). Some applications may require additional hardware/software. For additional guidance and information get in touch with the Red Pitaya community via the forum. A proportional–integral–derivative controller (PID controller) is a control loop feedback mechanism (controller) commonly used in industrial control systems. A PID controller continuously calculates an error value as the difference between a desired set point and a measured process variable and applies a correction based on proportional, integral, and derivative terms respectively (sometimes denoted P, I, and D) which give their name to the controller type. The MIMO PID controller consists of 4 standard PID controllers with P, I, and D parameter settings and integrator reset control. The output of each controller is summed with the output of the arbitrary signal generator. The PID can be controlled through FPGA registers that are described inside the PID controller section of the FPGA register map. Alongside other instruments, the Red Pitaya STEM board can be used as a SDR platform. A simple installation of the SDR Transceiver application will transform your STEM board into a SDR platform. To run the SDR on the STEM board you will need to install one of the following types of SDR software such as HDSDR, SDR#, PowerSDR mRX PS, GNU Radio or similar. The RadioBox is a complete transmitter and receiver done in the FPGA. You can directly connect an antenna at the SMA RF In 2 port for receiving. At the SMA RF Out 2 port you can listen to the demodulated signal. The transmitter does it at the same time on the SMA In/Out 1 connectors. When an external SDR-software is desired, you can select the Linux AC97 sound driver as stereo channels in both directions to feed the FPGA or to grab the data streams. To connect a SDR you can set the two AC97 channels to the I- and Q-signals of the QMIXers modulation. This application will model a physical system, turning the Red Pitaya STEM board into almost any linear system that can be included into a measuring and control circuitry. The modeling of the physical system is done by simulating the system H(z) transfer function with the Red Pitaya STEM board. In the application there are some predefined H(z) functions which will help you describe/simulate the desired system. Changing the parameters of the H(z) transfer function is done quickly through the application’s web interface. The Frequency Response analyzer enables the measurements of the frequency amplitude response of the desired DUT (Device Under Test). 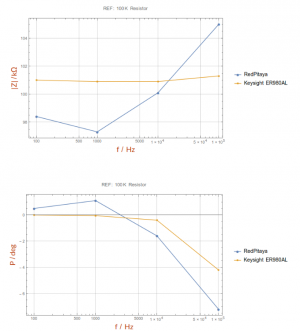 The measurements of the frequency response are in the range from 0Hz to 60MHz. The measurements are done in real time and the frequency range is NOT adjustable. Measuring can be done for each channel independently, i.e. it enables simultaneous measurements of two DUTs. The application works in such way that it is generating band noise signals on OUT1 and OUT2, this signal is fed to the DUT where the DUT’s response is acquired on IN1 and IN2. 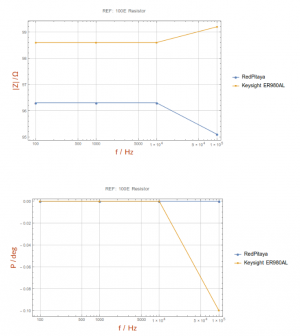 The acquired signals are analyzed using the DFT algorithm and the frequency response of the DUT is plotted on the GUI. This application is very useful for filter measurements and similar. 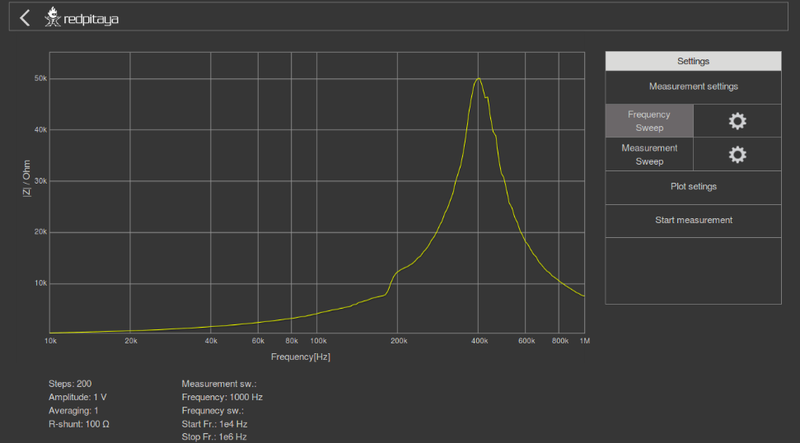 Frequency response analyzer enables measurements of frequency amplitude response of desired DUT (Device Under Test). 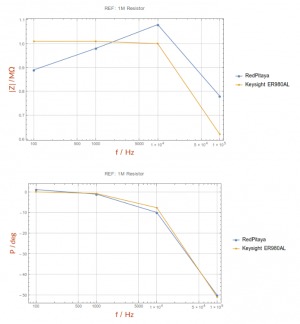 The measurements of frequency response are in range from 0Hz to 60MHz. Measurements are in real time and the frequency range is NOT adjustable. Measurement can be done for each channel independently, i.e it enables simultaneously measurements of two DUTs. 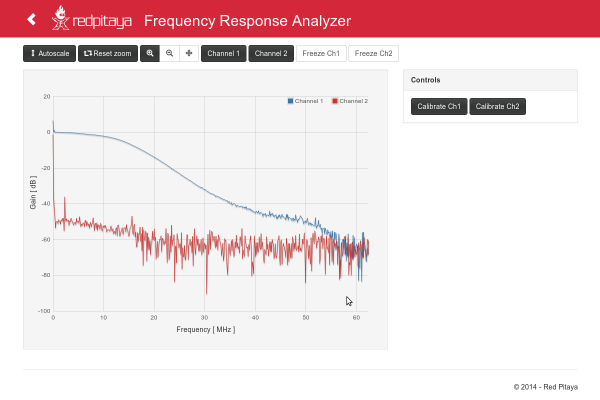 How to connect DUT to the Red Pitaya when using Frequency Response analyser is shown in picture below. EMC or electromagnetic compatibility is the property of the equipment telling us about the devices’ emission of unwanted electromagnetic energy and how they behave in an interfered environment. It also tells us what effects the emitted energy induces. This application is used for measuring the magnetic field that is part of unintended or unwanted electromagnetic emissions. When using this application, an additional front-end is needed where the application (trough gain parameters) can be adjusted to the users of front-ends. The Impedance analyzer application enables measurements of Impedance, Phase and other parameters of the selected DUT (Device Under Test). Measurements can be performed in the Frequency sweep mode with 1Hz frequency resolution or in the Measurements sweep mode with the desired number of measurements at constant frequency. The selectable frequency range is from 1Hz to 60MHz, although the recommended frequency range is up to 1MHz. The impedance range is from 0.1 Ohm to 10 Mohm. When using the Impedance analyzer application with the LCR Extension module, insert 0 in the shunt resistor field. Impedance analyzer application enables measurements of Impedance, Phase and other parameters of selected DUT (Device Under Test). Measurements can be performed in Frequency sweep mode with 1Hz of frequency resolution or in Measurements sweep mode with desired numbers of measurement at constant frequency. Selectable frequency range is from 1Hz to 60MHz, although the recommended frequency range is up to 1MHz*. Impedance range is from 0.1 Ohm – 10 MOhm*. When using Impedance analyzer application with LCR Extension module insert 0 in the shunt resistor field. 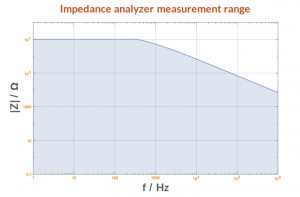 Impedance range is dependent on the selected frequency and maximum accuracy and suitable measurement can not be performed at all frequencies and impedance ranges. Impedance range is given in picture bellow. Range for Capacitors or Inductors can be extrapolated from given picture. Basic accuracy of the Impedance analyzer is 5%. Impedance analyzer application is calibrated for 1 m Kelvin probes. More accurate measurements can be performed in Measurement sweep at constant frequency. When using Impedance analyzer application optimal results are achieved wheni the Red Pitaya GND is connected to your mains EARTH lead as is shown below. We also recommend shielding of Red Pitaya and LCR extension module. On pictures below are shown comparison measurements of the selected DUT. Measurements are taken with Red Pitaya and Keysight precision LCR meter. From this plots you can extract basic Red Pitaya accuracy. Red Pitaya LCR meter/Impedance analyzer are not certificated for certain accuracy or range. Impedance analyzer application can be used without LCR Extension module using manual setting of shunt resistor. This option is described below. You will need to change C_cable parameter in the code when using your setup. The Multichannel Pulse Height Analyzer (MCPHA) is an instrument used for the analysis of electrical signals in the form of pulses of varying heights which may come from different sensors and similar. The pulse signals are acquired where the number of pulses of each height is saved and the histogram plot is given where the X axis represents the pulses’ amplitude, and the Y axis represents the number of pulses. With the Red Pitaya STEM board, you can acquire pulses whose period can be in the range from 1us to 1s.